"It is not so much a drink as a lifestyle." prepared for him at St. Elmo Bar in Bisbee, Arizona. New Year's Day is officially National Bloody Mary Day. Yes, there is such a thing. Little wonder then that such a day is proclaimed after such a night as New Year's Eve. For all of you that are about to party like it is 1999 (which I fondly recall as one my happiest, best New Year's parties ever), you'll want to prepare your Bloody Mary mix ahead of New Year's day. Don't delay, make it now! A little throw back action to our Millennium NYE Party. I will boldly make this proclamation: no one makes a better Bloody Mary than my sister, Juliette. She's got the skills, she's got the know how, she's got the experience. And lucky for you, she's sharing her recipe right here, right now. The key to an excellent Bloody Mary is to prepare the mix a least a day ahead of time to allow the tomato-y goodness to rest and let the flavors meld. Juliette compares making Bloody Mary mix to preparing a great soup. It's always better the next day. Juliette recommends making the Bloody Mary mix at least a day before you intend to use it. It will keep in the fridge for at least a week. Back in the day when Juliette tended bar at St. Elmos in Bisbee, she used both V8 and Clamato in equal proportion. Then one day she read the label on the Clamato bottle and discovered, much to her surprise, that the ingredients list contained both high fructose corn syrup and MSG. What the H? Out with the Clamato and in with the clam juice. Feel free to omit the clam juice if you have any vegans in the house. Bloody Mary's with fermented green beans, asparagus and Giardiniera. 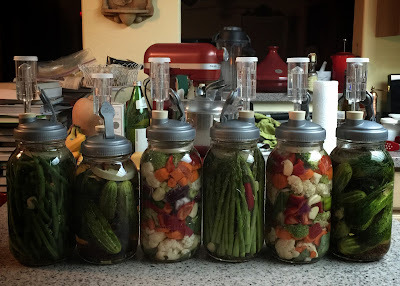 The fermenting caps by FARMCurious are terrific. Two thumbs up! 1. To make the mix, in a large 3 quart pitcher, add everything but the V8. Whisk well, then add V8. Mix again and refrigerate. This mix is best used cold (put the booze in the fridge or freezer too while you are at it). 2. To make a Bloody Mary, fill a pint glass with cubed ice. Pour 3 ounces of an inexpensive good quality Vodka such as Svedka, Smirnoff, or Skyyy - anything else is overkill - you won't be tasting the vodka much anyway! Fill glass with mix, add a squeezed lemon wedge. If you like, cap the glass with a shaker and shake vigorously. Pour the Bloody Mary back into the pint glass and add celery stalk, olives and your choice of pickled gourmet veggies. Juliette prefers one extra long fancy frilled toothpick with okra, sweet cherry pepper, and cauliflower. 4. Bloody Samurai - use Sapporo instead of the Guinness, wasabi instead of horseradish, Sriracha Chili Sauce instead of the Tabasco, and tamari (or soy sauce) instead of the Worcestershire. Use pickled green beans and long dried pieces of seaweed (Ito Wakame) for garnish. On the left, homemade Giardiniera and on the right, fermented asparagus.